I’ve never been to a Cirque Du Soleil show, despite their proliferation across the Vegas strip, so when I was offered free tickets to go and see the latest extravaganza – Viva Elvis – I jumped at the chance. Not only was I curious to see just what all the fuss was about regarding Cirque du Soleil, but it was a great chance to check out the new Aria hotel as well. So, with my partner Clare excitedly joining me, we settled down for an hour and a half’s worth of entertainment. So how much did Viva Elvis entertain? Can I recommend it, and would I see another Cirque Du Soleil show? And never mind my cynical opinion, what about my better half’s? 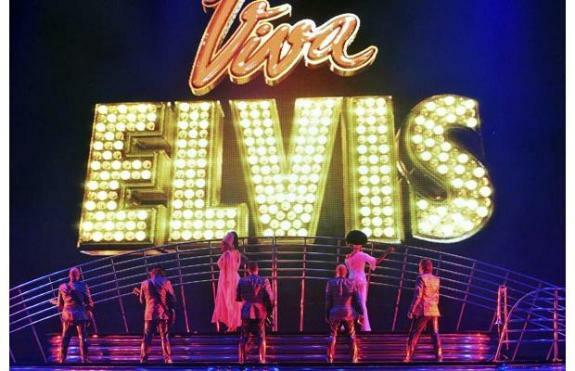 Viva Elvis is a stage show performed by the astonishing acrobats of Cirque Du Soleil who bombard you with amazing acrobatic routines, and are joined from time to time by individual singers, guitarists and even a rock band. The hour and a half show is interspersed with commentary from a fat Col. Tom Parker, who’s wheeled onto the stage to give a brief two minute intro to the next scene, and which neatly gives the performers time to setup the stage for the next part of the show. And some of it takes some setting up – in particular, the huge platform needed for the Got a Lot of Livin’ To Do sequence, which weighs over 30 tonnes! 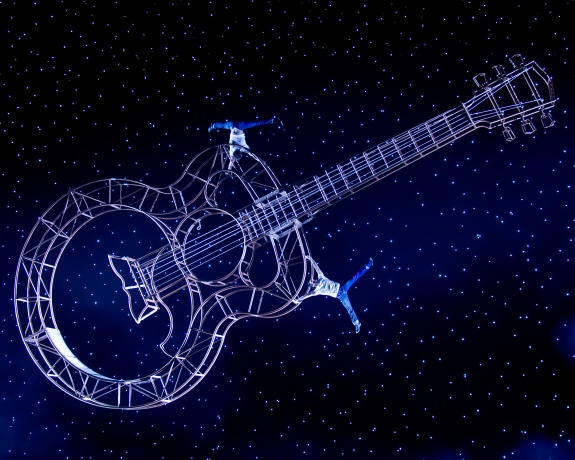 The show itself is meant to follow the life of Elvis, but in reality, Elvis is just a prop, with the most tenuous part of his life used a hook around which each section is hung. For example, the same Got a Lot of Livin’ To Do set features a series of 10 or so acrobats jumping around different platforms, all dressed as super-heroes. Why? because “Elvis loved to read Comic Books”!! Yep, this is the depth of the tie-in with Elvis’s life. The show doesn’t exactly keep it real! I’m not a fan of the theatre or shows, and I’ve not been to too many circuses, either, so although I was looking forward to seeing the show, I had no idea what to expect, or how much I’d enjoy it. As it turned out, I did enjoy it – mostly! Some of the sets were a bit dull – Don’t Br Cruel, King Creole and One Night With You were both boring and had very little to with either Elvis or Cirque du Soleil! But some of the more lavish sets, such as Bossa Nova, Viva Las Vegas and Jailhouse Rock were just brilliant to watch and very entertaining. Without doubt, though, the best set of al was Got a Lot of Livin’ To Do. This alone made the whole experience worthwhile as the acrobats jumping around in perfect synchronisation was just mesmerizing. As I said, it had absolutely nothing to do with Elvis, but despite (or because of?!) that, it was simply breathtaking and well worth watching. I won’t bother listing the contents of each scene – you can read about them all at the Viva Elvis Web site – but I will focus on whether I think it’s worth going to or not. Is Viva Elvis worth watching? At the end of the show, I felt I’d enjoyed myself – it was an hour and a half that was definitely fun and mostly entertaining. Parts of it were dull, but the parts that weren’t more than made up for it. However, the price of the tickets is not cheap. We had good seats, but they were kindly provided us for free so long as I reviewed the show (hence this review!). Had we paid, they would have cost us between $99 – $179 (although you can get them for less if you use one of Vegas’s many cheap ticket booths that you can find up and down the strip. There’s seem to be a few by the M&M Store, for example, and another one at the Fashion Show shoppping mall). I have to say, I would not have paid that much for the show. If I loved Elvis, it might have been worth the money, just because of the number of Elvis tunes throughout the show, but if you’re watching it for the Cirque acrobats, I think you’ll be disappointed. 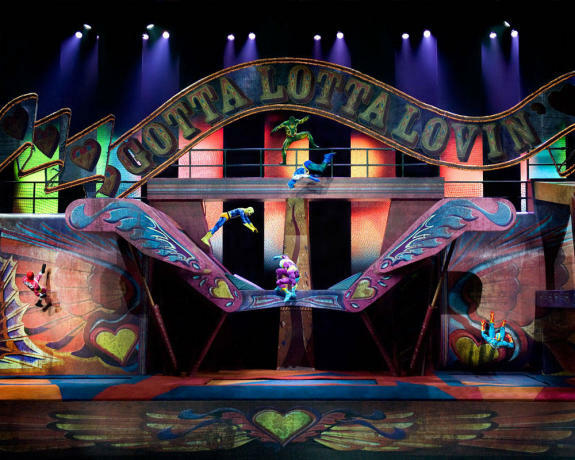 Certainly reading reviews of other Cirque shows, there seems to be much more acrobaticalness (yeh, I just made that word up!) in many of the other shows, such as Mystere and O. There’s also much more, er, flesh, so if you’re looking for a more saucy evening, I’d go see one of those instead. With Viva Elvis, not only was everyone fully covered, everyone was dressed to look like Elvis – even the girls, which was just bizarre! The venue was the theatre in the Aria, and this was absolutely stunning. It was simply huge, beautifully lit with superb acoustics and really comfy chairs. Looking at the height of the place was awesome, and you got a real feeling that something special was about to be performed. 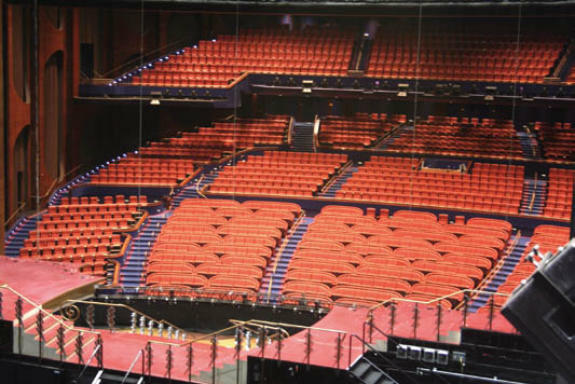 If the Aria ever plays host to a singer or band that you love, it’d be a great place to see them, as the theatre was simply increrdible! These are my thoughts, though, and I’m almost uniquely cynical about such things! What did Clare, my better half think? Well I just asked her, and she said pretty much the same as me: if you’re a fan of Elvis, you’ll love it; If you’re a fan of Cirque Du Soleil, there are much better Cirque performances on the Strip; and ultimately, we both loved the show, but would really have resented paying for it! So in sumamry, then, I had a great time with Viva Elvis, and would like to thank Julian for the free tickets. But ultimately I was left a little disappointed, and very glad I hadn’t paid for it. It has, though, left me wanting to see another, better, Cirque performance, so next time in Vegas, I’ll try to check one out, as it’s certainly a great way of enjoying the evening. So that’s what I think? What about you? 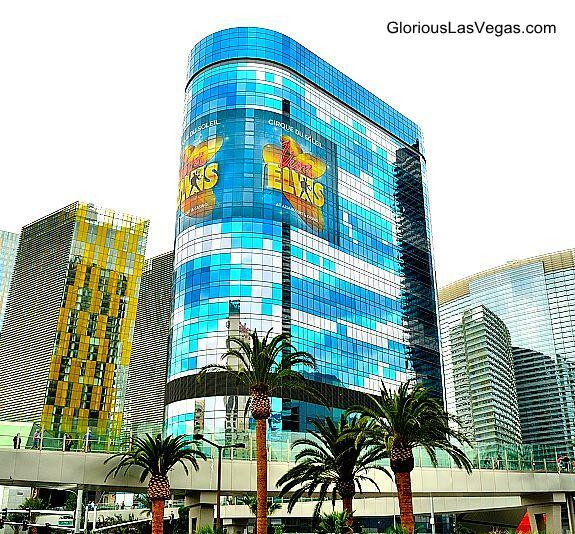 Have you seen Viva Elvis or any other Cirque performance on the strip? What were your your impressions, and what would you recommend? In addition to your post I was wondering, Is it good? I have front row center tickets next week! 🙂 I’ve seen Zumanity, O, and Mystere. Is it as good as those?